Albania is a country in the south east of Europe with a coastline on the Ionian and Adriatic Sea. It has land borders with Macedonia, Kosovo, Montenegro and Greece, and at the narrowest point of the Ionian Sea, the west coast of Italy is less than 50 miles from eastern Albania. Emerging from a turbulent history, modern Albania has recently been experiencing rapid growth in tourism and foreign investment, and it is now commonly recommended as one of the top tourist destinations in the region. 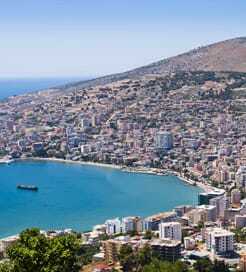 Albania has two main ferry ports, at Durres in the north of the country, and at Vlora in the south. Year round and frequent ferry services operate from numerous ports along the Italian coast connecting the top, middle and bottom of the country with Albania. The majority of crossings are on the Bari Durres route. In recent years the road network in Albania has been undergoing significant improvement, and all major cities and ferry ports are now linked with newly constructed or well maintained roads. Some rural locations, however, are still not served by paved roads. Albania is home to a wealth of archaeological heritage spanning the Illyrian, Greek, Roman and Ottoman eras. Popular sites include the Rozafa fortress, which overlooks the city of Shkoder, and the Roman and Greek ruins at Butrint, near Saranda. Butrint is one of three UNESCO World Heritage Sites in Albania (the others being Gjirokastra, and Berat), which have been classified as having worldwide cultural importance. The capital city of Tirana is located around 16 miles east of the ferry port at Durres, and boasts a vibrant nightlife of clubs, bars and restaurants including the Sky Tower Rotating Bar. There is plenty to do during the day as well, as the city is home to the country's National Historic Museum, National Archaeological Museum and the National Art Gallery, along with numerous other cultural and historical attractions. Albania is also popular for its beautiful, unspoilt beaches and its amazing panoramic views. In particular, the Albanian Riviera offers gorgeous sandy beaches, breathtaking sunsets and authentic traditional seafood cuisine. Elsewhere, the country's rugged mountains and spectacular lakes offer hiking adventures, and in the north of the country lies the National Park and the beautiful Valbona River. "It's better to forget it"
The ferry journeys between Bari and Durres and the return Durres to Bari is one I am not likely to repeat. Both ports could do with learning how to organize car ferries. I suggest the port authorities visit either Dover or Calais to see how it should be done. The ferry in both directions was late leaving and slow and grossly over crowded. The ferry from Durres to Bari was about 5 hours late added to which there was about a 2 hour wait to get through passport control. This put unwanted pressure on my drive to Calais where I had another ferry to catch. I doubt if I shall be using the Bari - Durres ferry again. I might also add the food in the cafeteria was only luke warm. I think next time I visit Albania I shall go by air. I would not recommend this ferry service. The trip started 5 hours behind schedule, arrived 5 hours late and we had to wait another 2 hours to disembark, total 7 hours delay !!! the worst trip I ever done. The departure was more than 1 hour late, boarding process very slow, too many people booked with deck space and they were sleeping everywhere on the floor. 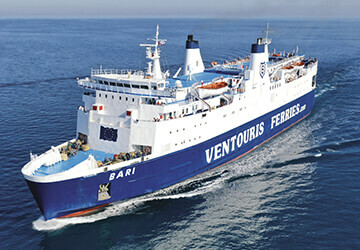 For more information, please visit our Ferries from Ionian Islands to Albania page.